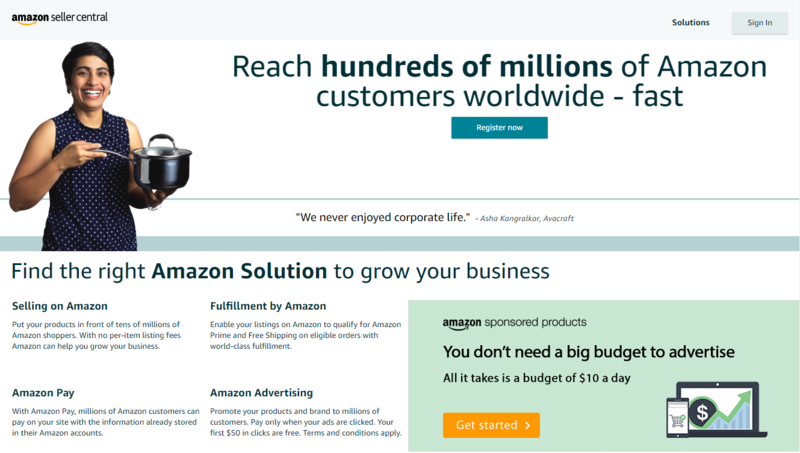 If you're selling on Amazon, you're already on one of the world's biggest marketplaces. If you're doing well, you might wonder what benefits starting your own online store can offer you. Aren't you already serving a customer base of millions? Sure, but as it turns out, having your own website with an integrated online store will help your business in several ways, and not just by skipping Amazon's seller fees. Here are five reasons you should start your online store today. Amazon is happy to extend its offerings through third-party sellers like you, but they offer no means for you to stand out as a company. Amazon shoppers believe they are buying from Amazon, even if they're buying from you! Building your brand on Amazon is impossible, and only rarely will your customers gain loyalty to you as a seller. If you open your own online store, you'll have full control over your branding, your site design, your customer service, and your checkout experience. Your eCommerce website can serve as a hub for all your company information, including an "About Us" page and how to contact you. You can even add things to your site that would interest your target audience, such as informative product pages and additional helpful content. There's also the option of a blog. With your own website, you can get started building your brand into a powerhouse that could one day be on the tip of every customer's tongue when they're discussing the most reliable and best place to buy your type of products. That's something you could never do on Amazon. Amazon doesn't let you access your prior customers — after all, they're technically Amazon's customers first. But with your own online store, you can change all that: with the proper eCommerce software, your site will maintain a database of every customer, every sale, and every interaction you've had with the people who buy from you. That means you can always get in touch with them, which opens up enormous marketing possibilities. The best customers are always repeat customers, which is why customer retention is so important. Getting a new customer can cost up to 25 times more than keeping an existing one, so maintaining a focus on your existing customer base is vital. Offering a fantastic shopping experience is a great place to start, but the real power comes from your marketing, and having access to customer email addresses means you can leverage the strongest form of online marketing available. Email is a powerful tool in eCommerce, or more accurately it's the form taken by several different tools. These include newsletters (with interesting readable content mixed in with the sales promotions), autoresponders (such as "thank you for your order" emails, which can also suggest related items the customer may have an interest in), and abandoned cart recovery emails, which remind customers with items in their cart to return and finish their purchase. All three of these are extremely valuable to you, and you can't use them at all on Amazon. B2B sales are one of the most lucrative ways to sell your products, but Amazon is completely focused on B2C (business-to-customer) sales. B2B buyers also have very high standards, and they frequently purchase similar products at repeat intervals. If a B2B buyer attempted to make this type of purchase on Amazon, they may run into problems such as inconsistent quality, or be unable to find the exact same item they purchased last time. This presents problems due to the nature of making business purchases — the buyer often has a very strict budget, or even exact stipulations as to what they can buy right down to the brand name. With your own online store, you can provide what B2B buyers are looking for: a trusted, consistent brand that delivers what they need. And even though B2B buyers are shopping for a business, they want a shopping experience that mirrors B2C, and there's no better way to accomplish this than with an eCommerce website. It's easy to conclude that Amazon sells everything, but in fact there's a long list of prohibited items that you cannot sell on the Amazon marketplace. Some of these are obvious (like illegal drugs), but others are less so — for example, products that compete with a service offered by Amazon, such as "certain streaming media players, voice assistant devices and related accessories." An example of this type of item would be the Google Chromecast, a video streaming device that could act as an alternative to one of Amazon's own services. Obviously, to sell certain products you're still going to need a license, and a form of age verification on your online store, but you won't face the restrictions imposed by Amazon. And while Amazon prohibits some items, it occasionally allows accessories for those items, for example vape mod cases and tool kits. This means you can still sell some related products on Amazon while keeping the restricted items on your own site, which is the best of both worlds. You're also free to offer your own service plans and warranties, which Amazon does not permit you to do. This is a big one. When selling on Amazon, you need to abide by their terms and conditions, but with your own online store, you're free to operate your business as you see fit. You can define your own policies and standards, as well as your own office hours, and there's no risk of being penalized by one of Amazon's systems, such as receiving a warning for not answering a customer inquiry within 24 hours over the weekend (of course, you may want to do this anyway!). In order to reap the benefits of your own online store, the first thing to do is to sign up for an eCommerce platform that offers an easy Amazon integration, like 3dcart. Look at Amazon's guidelines and your own profit margin to decide which products you want to sell on which platform, or both. We also highly recommend you enable Amazon Pay on your online store, because it allows customers to check out using the saved information in their Amazon account. This way, the convenience and trustworthiness of Amazon will transfer to you, even if your web site is fairly new. To learn more about selling successfully on Amazon, we've created a free ebook just for you. Download it below.